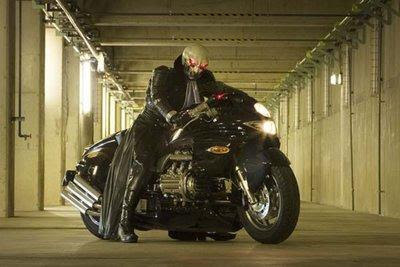 Skullman: Prologue To Darkness is a live action movie starring Kamen Rider Hibiki's Shigeki Hosokawa and pop singer Ami Suzuki. The movie is considered as a prequel to the Skullman anime series and a pseudo-prequel to Cyborg 009. Skullman: Prologue To Darkness' story closely focuses on a journalist named Hayato Mikogami who returns to his hometown at Otomo to investigate strange rumors of killings done by a man wearing a skull mask. Tailed tightly by a young photographer, Kiriko Mamiya, the two soon uncover the many strings of connections between the victims, a local pharmaceutical company, a mysterious new religious sect and strange half human, half animal creatures, which roam the night streets for blood.